I did not make any New Years resolutions for 2016. I’ve never been a big resolution-maker. I know myself too well and I know that promises to myself will be the first to go when things get tough. But I have, over the years, become a better goal-setter. Especially since my Coro Fellowship, which focused on clarifying values and setting goals in order to more fully live out those values. In early December 2015, recognizing that the me I was going around living inside of was not at all the me I wanted, I stopped pretending to write in my journal (which I had been neglecting for some weeks), and bought a new notebook. And this notebook is something, let me tell you! 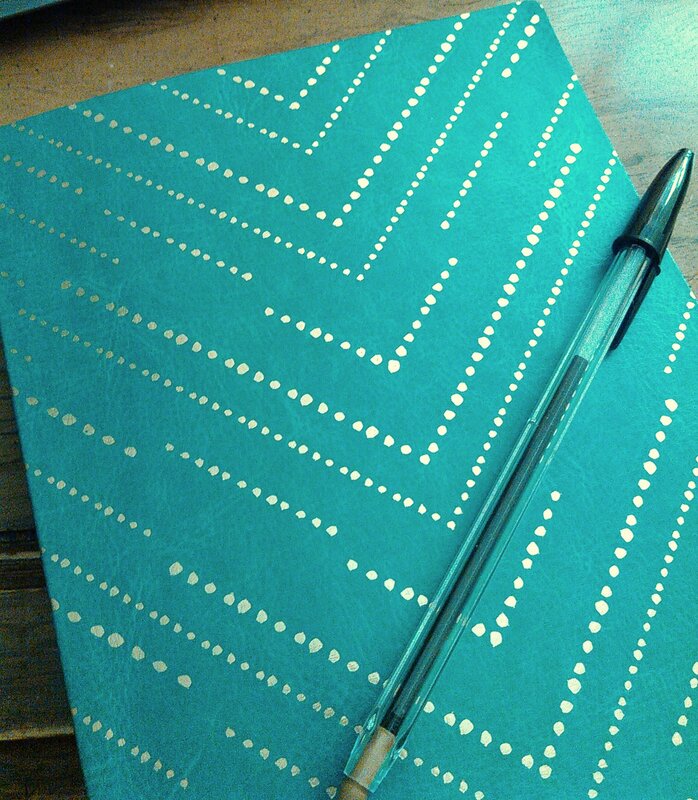 Its cover is soft teal pleather with gold dots in a trendy chevron pattern streaming downward across its surface. The pages are a fine and pleasing shade of cream, smooth, thick enough to feel substantial. And it claims to be made from 60% recycled paper and non-toxic soy-based ink, so it soothes my guilt machine. I bought this journal intending to give it as a Christmas gift, but I’ve decided to use it for myself instead. Last week, I laid out a daily / weekly / monthly map of small goals for making myself feel more “on purpose,” more connected to my joy. I’ve decided to use this journal as a log to track my progress and my challenges with those goals. In the past, layering too much structure onto my journaling has been a source of pressure and stress. If this journal / log becomes stressful, I give myself permission to stop and use the book for something else. But I hope that it will become a soothing ritual to end each day. No pressure. If I can’t fill in one or any of the spaces one day, I promise to keep loving myself. And so far, it has gone well! At the end of each day, I log my SLEEP, my BODY, my FOOD, my JOY, and my GRATITUDE. Did I sleep enough, and was the sleep deep? Did I move my body enough and how did my body feel throughout the day? What did I eat, and was it enough and was it good food? What brought me joy today? What am I thankful for today? In the many other repetitive thought patterns that cycle throughout my day, this one practice has become a ritual of reminding myself what I find to be important. There have been days when I’ve had to forgive myself for forgetting to log before I went to bed. And some days I can’t think of anything that brought me true joy. And I have forgiven myself, and gone on to the next day. I’m still not a perfect goal-setter, just as I’m not a perfect me. Or, I should say, I’m great at setting goals, but not so much at sticking to them. This practice of logging my day has been easy to stick to, and so I file that away in my self-knowledge file and hope to be able to use it to stick to other goals too. How do you hold yourself to your goals or resolutions?